Wales is a country with an epic past. Celtic roots run deep through its land, 641 castles adorn its coves and hilltops, and a rugged 870-mile coastline decorates its perimeter. But the nation is also rich with history, spellbinding stories and mythical creatures. From Bardsey Island in the north to the hills of Carmarthenshire in the south, Wales is etched with the legend of King Arthur. Yet the question remains: was Arthur a mighty monarch or is he mere fiction? The only way to discover the truth is to visit the sites that hold the legends. You’ll feel like royalty in Ruthin Castle, a medieval castle once owned by King Henry VIII and Queen Elizabeth I. Although it’s now a hotel, it began as a wooden fort that many believe King Arthur frequented. Be sure to explore the quaint market town and see the boulder which beheaded Arthur’s rival, Huail, in an epic clash. Legend says, Huail made the fatal mistake of invading Arthur’s lands, stealing his mistress and mocking him for a slight limp which Huail, himself had inflicted. Just 30 minutes from Ruthin Castle is Llangollen – a town where you’ll find the greatest concentration of place names linked to Arthur and his extended family. Search for the Holy Grail at the romantic ruins of Castell Dinas Bran, castle ruins set high atop a hill with sweeping views of Llangollen. Visit Guinevere’s Cross at Gwenhwyfar, the only site in Britain that shares a name with Arthur’s wife. Take a day trip to Snowdonia National Park where you’ll find a host of sites linked with Arthurian folkore. Search for the crystal-blue lake of Llyn Lydaw. Legend says the magical sword, Excalibur is lying at the bottom of its waters. While in Snowdonia, Mount Snowdon is said to be the burial site of resident giant, Rhitta. Arthur slayed the beast – who fashioned clothes out of the beards of his fallen enemies – for betraying him and running off with his mistress. 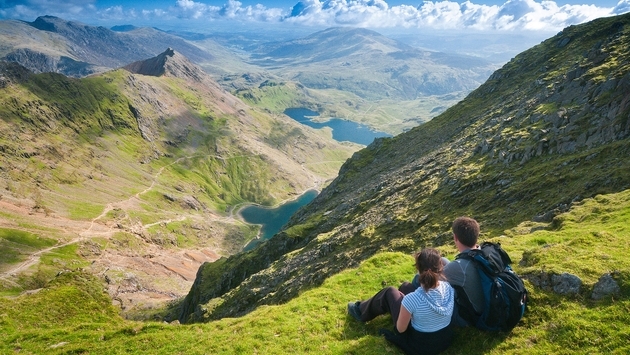 If you don’t want to hike, board the Snowdonia Mountain Railway – a historic steam train – and ride to the summit where you can enjoy breathtaking views from the highest peak in Wales. Make your way to the Llyn Peninsula, an Area of Outstanding Natural Beauty. Once you’re there take a boat ride to Bardsey Island, the “Island of 20,000 Saints.” According to the legend, the island is also known as Avalon, where Merlin took King Arthur on his final voyage. Some believe that Merlin is imprisoned here in a building made of glass. As you discover the epic legends of Wales, journey south to Carmarthen, a town reputed to be Merlin’s birthplace. Visit Dinefwr Castle, where the wizard is thought to have communicated with spirits in a nearby cave. While in one of the most beautiful regions in Britain, visit the Gower Peninsula to find Arthur’s Stone. Legend has it that Arthur threw a pebble from his boot across the estuary which, during flight, assumed magical proportions and landed on the hillside of Cefn Bryn. Spend your final day in the town of Caerleon. In Welsh, the town’s name means, “City of the Legion,” but locally it’s known as “Camelot.” Legends say that after the Romans left Britain, King Arthur set up court here. Some believe stories of the round table are linked to the Roman amphitheater in Caerleon, which is considered the best preserved in Britain. Find out for yourself by exploring the bath-house and barracks. Nearby is the National Roman Legion Museum where you can discover what life was like almost 2,000 years ago. Your journey awaits in the land of dragons, wizards, knights, kings and queens.